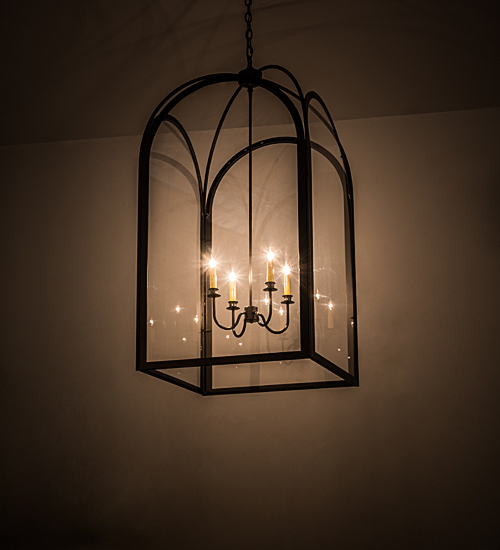 Description: Inspired by the arched profile of windows found in landmark cathedrals and majestic castles, the luxurious Perin features Crystal Idalight panels that reveal an Amber four-light faux candelabra. The gracefully styled frame and hardware are offered in a warm Oil Rubbed Bronze finish. Handcrafted in Yorkville, New York, the 24.5 inch wide pendant is available in custom sizes, styles and finishes. Dimmable energy efficient lamping options such as LED are offered. The elegant fixture is UL and cUL listed for dry and damp locations.